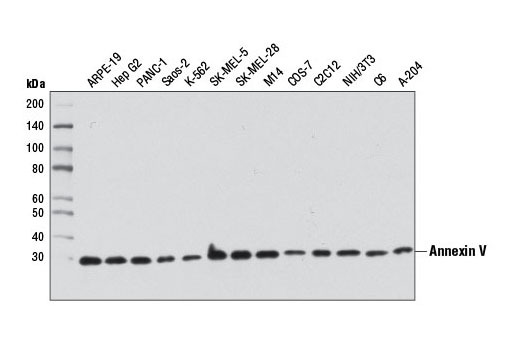 Western blot analysis of extracts from various cell lines using Annexin V Antibody. Annexin V Antibody recognizes endogenous levels of total annexin V protein. This antibody is not predicted to cross-react with other annexin family members. Polyclonal antibodies are produced by immunizing animals with a synthetic peptide corresponding to residues near the amino terminus of human annexin V protein. Antibodies are purified by protein A and peptide affinity chromatography. Annexin V, also known as PAP-1 or Lipocortin V, is a ~30 kDa protein that binds to phospholipids in a calcium-dependent manner (1). All annexins contain a putative PKC binding site, but only annexin V has been identified as an inhibitor of this pathway (2). It may also signal, by direct interaction with VEGFR2 receptor, in the regulation of vascular endothelial cell proliferation (3). Annexin V preferentially binds phosphatidylserine, in competition with prothrombin, leading to inhibition of blood coagulation at sites of injury preceding contact between lipid components and coagulation factors that initiate thrombosis (4-6). The ability of Annexin V to bind specifically and robustly to phosphatidylserine makes it an attractive reagent in detecting apoptotic cells (7). Annexin V is inducible by glucocorticoids and can be phosphorylated by tyrosine and serine/threonine kinases (8). It is thought to block production of mediators of inflammation, such as prostaglandins and leukotrienes by inhibiting the release of arachidonic acid from membranes by phospholipase A2 (8). Huber, R. et al. (1990) EMBO J 9, 3867-74. Cardó-Vila, M. et al. (2003) Mol Cell 11, 1151-62. Wen, Y. et al. (1999) Biochem Biophys Res Commun 258, 713-21. Koopman, G. et al. (1994) Blood 84, 1415-20. London, F. et al. (1996) Biochemistry 35, 16886-97. Thiagarajan, P. and Benedict, C.R. (1997) Circulation 96, 2339-47. Vermes, I. et al. (1995) J Immunol Methods 184, 39-51. Grundmann, U. et al. (1988) Proc Natl Acad Sci USA 85, 3708-12. The Annexin V-FITC conjugate is a product manufactured for Cell Signaling Technology, Inc. by TAU Technologies BV.